SO. I've decided that I'm not feeling particularly eloquent, smooth, wise, or wordy today...but I'm going to write anyway. My apologies in advance for a potentially rough/jumbled read...but perhaps it will give you a clearer picture of what my brain actually looks like right now....blah. Emri and I have made ourselves nice and cozy at Seattle Children's Hospital AGAIN. Guys, we've been in and out of this place like every other weekend since July. We've been seen for a spinal fluid leak, (which included a sedated contrast CT scan), a loose spinal rod screw, (I DON'T KNOW HOW) potential spinal rod infection, strep throat (but we came in to be evaluated for a potential bacterial meningitis), pneumonia, and yesterday we came in to see if the pneumonia was back. The pneumonia does not seem to be back, but we are now inpatient because of an overwhelming amount of concern (from me, the doctors and also the random, semi-annoying, overly verbal child at the park that told Emri she was too skinny). This is what I know. Emri has infantile marfan syndrome. Kids with infantile marfan syndrome are really skinny. Kids with Infantile marfan syndrome don't gain weight easily or quickly...but they do gain weight. Emri hasn't really gained weight in like a year. This is concerning. Emri weighs about 32 pounds and is 7 years old. The average weight of a THREE year old girl is 30-36 pounds. These are all the facts. Emri literally has not caught a break from sickness since July. Our family has had all of the viruses. As of late, when Emri gets a virus, it lingers right on into the next virus... and just seems to wreak havoc on her frail little body. You would *think* that Emri can't possibly lose weight, but she does somehow. It's so scary to see. What I have learned over the past month about Emri while researching and asking questions is that although Emri is not psychologically anorexic, she is physically. Her little body is starving itself. She has no appetite, no fat, and nothing stored up to fight viruses with. She is malnourished. This is not because we don't feed her. She eats food by mouth and gets 3 tube feedings daily. It's just apparently not enough. Are these words as painstaking for you to read as they are for me to write?!?? Anorexia, malnourished, starving. Anorexia, malnourished, starving. I am Emri's mother. I feed this kid. I work hard to get all three tube feedings in her tummy by the time she goes to bed...and she's still "starving". I'm her mom and I see her body on a daily basis. It's hard for me to look at. I can't imagine how shocked the world must be when they see her. This is really hard. Just like it was hard to hear that Emri has marfan syndrome, a "HUGE aorta", leaky heart valves, severe kyphoscoliosis, -20 vision, restrictive lung disease, may be wheel chair bound...etc. Unlike many issues that have arisen in the past, there are no clear answers/solutions to this problem. There is, however, hope seen through the recent weight gain of some of Emri's more severely affected marfan friends. 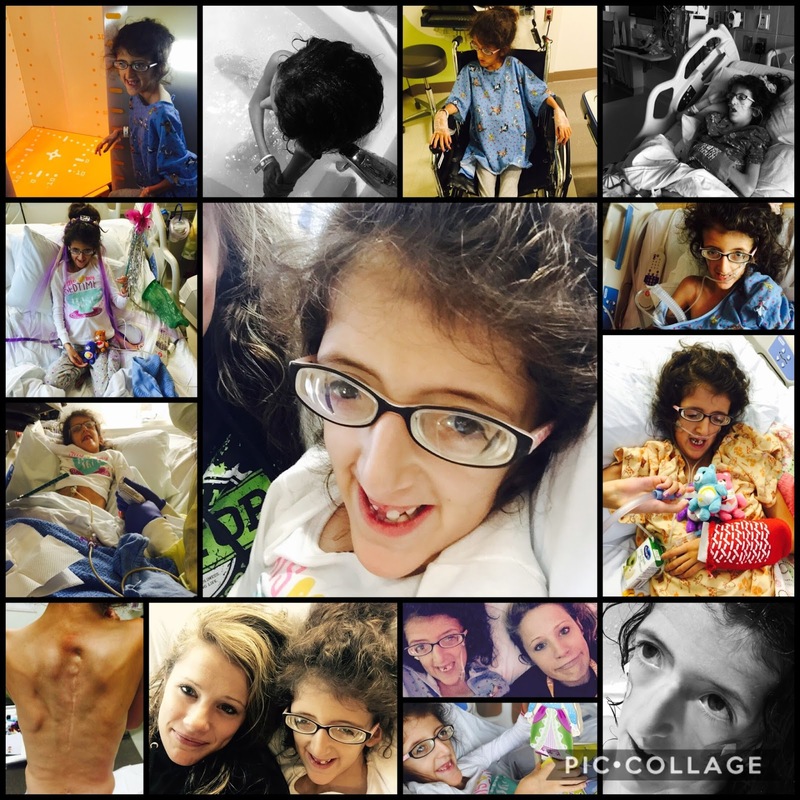 After communicating with another marfan mom and reading her story on how she worked with a gastroenterologist at Hopkins and a nutritionist in her area to have her daughter actually put on weight, we are going to attempt the same protocol in an attempt to have Emri also gain some weight. We are hoping and praying that Emri can tolerate the amount of formula she needs through her tube and that she will not entirely lose interest in eating by mouth. Obviously this program is going to require more of my time, attention, energy, and perhaps even some math. Counting calories, more tube time, and consistent weigh-ins will all be added into our already chaotic schedule. 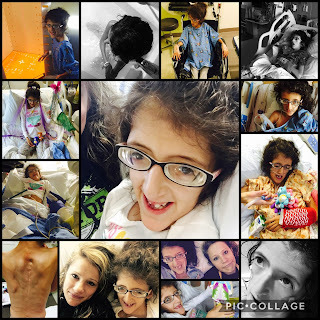 Obviously this dear, sweet girl of mine is worth every new contraption and calorie counting protocol thrown at us, but you can all still pray for us as we navigate yet another obstacle in this challenging marfan life. Here is a hospital pic collage for your viewing pleasure...because when you are in the hospital, you have time to do these silly things. Also, here is a link to Emri's current favorite song...because she likes to pick songs that make her mom cry. And because...truth. Enjoy.